AncestorPuzzles.com: I Found the Church but Where Are the Records? I Found the Church but Where Are the Records? When researching the origins of a German immigrant ancestor, you must find the church records for his or her family as these are the records that will most likely contain their place of origin. 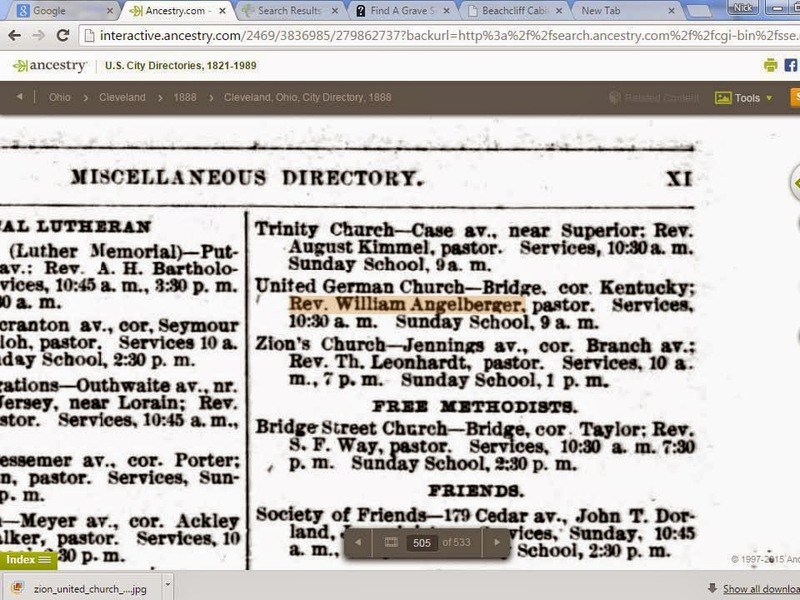 I am attempting to find the origins of the Prasse family from the west side of Cleveland in the church records of the German United Evangelical Protestant Church. 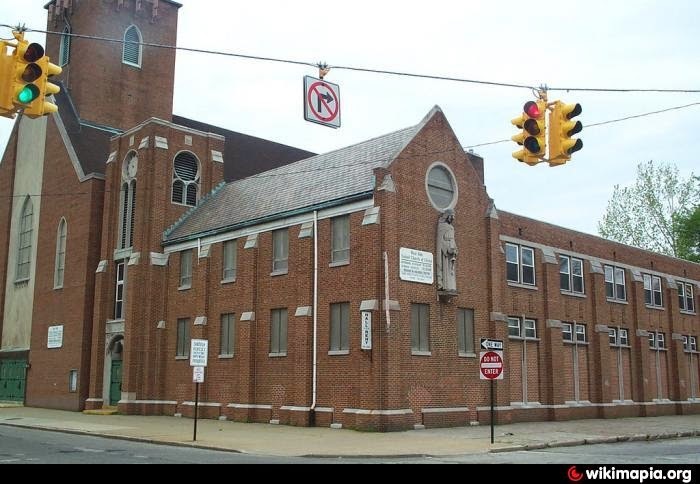 I have been able to find that there is still a church building located on Bridge Street. The current occupant of the building is the West Side United Church of Christ. I have made some inquiries with the Western Reserve Historical Society to see if they have the church records. In particular, I requested information on the marriage of Augusta Prasse and Frederick Zluhan. Augusta was born in Saxony, Germany and came to the United States around 1862. Hopefully her marriage record will reveal the place of origin of the Prasse Family. The name of the minister who performed the Zluhan/Prasse marriage was found in the civil marriage record. Searching for the minister in the city directory led to the following listings for the church. The Reverend William Angelberger served the German United Evangelical Protest Church from 1880-1894. There are several other records related to the Prasse family which should show up in the church records. Dr. Roger Minert has stated that church records reveal the place of origin of German immigrants over 60% of the time. I have prepared a combined timeline and research log for the Prasse family to help me identify the records to search. I recommend this approach to you and hope you will use this timeline as an example for your family research. Gustave Carl A. Prasse was born on January 12, 1826, near Leipzig, Germany. He married Christina Anna Sisser in 1845 in Sachsen, Germany. They had nine children in 13 years. He died on July 22, 1912, in Cleveland, Cuyahoga County, Ohio, having lived a long life of 86 years, and was buried at Monroe Street Cemetery in Cleveland, Ohio. 1826- Gustave Carl A. Prasse was born on January 12, 1826, in Leipzig, Germany. His death certificate says 12th of January 1826. 1900 census says January 1828. 1870 and 1910 censuses support the 1826 birth year. 1870 & 1880 censuses support Saxony (Sachsen) as a birthplace. Family trees contain the Leipzig locality but no source has been cited. No record of his birth has been found. 1852- Augusta Prasse was born between 1849 (per 1870 census) and Jul 1852 (per 1900) in Sachsen, Germany No record of her birth has been found. 1856- Gustave Prasse immigrated in 1856 (per 1900 census). This conflicts with the date of birth for son Herman in Germany. However 1870 census says Herman was born in Ohio about 1858. Neither Gustave, Christianna, Augusta or Herman have been found on a passenger list. 1858- Herman Prasse was born in Leipzig, Sachsen, Germany per oral tradition of the family. Some of the records state he was born in Ohio. No record of his birth has yet been found. 1867- The other Gustave Prasse naturalized in 1867. Naturalization ID#: 29198; Name: Prasse Gustav; Name of Volume: DOA; Vol 2; Page 8; Germany; Date of Arrival: 6/1855 Date of Naturalization: 8/22/1867 Requested from Cuyahoga County Archives 4 April 2015. 1868- A man named Gustave Prasse appears to be living on Union Street in Cleveland per tax list however there were two men named Gustave Prasse living in Cleveland. 1869- City Directory shows Gustave working as a laborer and residing at 241 Birch, Cleveland. The family residence listed in the Cleveland city directory, through 1901, was 241 Birch St. This street is on Cleveland's west side near West 50th St. and the Nickel Plate Railroad tracks. 1870- Gustave Prasse was 44 years old and lived in Cleveland Ward 11, Cuyahoga, Ohio. The place of birth for Gustave is listed as Saxony on the 1870 census. 1872- Herman Prasse died in Cleveland at age 14. He was buried at Monroe Street Cemetery. The burial service may have been conducted by a church. The church book may contain his place of birth. 1872- Naturalization ID#: 29199; Name: Prasse Gustav Name of Volume: NB Vol 7; Page 105; Country: Germany; Date of Naturalization: 10/23/1872 Requested from Cuyahoga County Archives 4 April 2015. 1872- Augusta Prasse marries John Schweitzer on 6 August 1872. The marriage was performed by Rev. Philip Stempel at the United Evangelical Protestant Church – Founded in 1853 at Kentucky St. (now 38th Street) near Bridge. Known as Stempel’s Church after Rev. Philip Stempel. He served from 1871-1874. 1873- This is the approximate date of birth for Charles Schwietzer son of John Schweitzer and Augusta Prasse. He later adopted the name of his step-father, Fred Zluhan. The death certificate of Charles Zluhan aka Sluhan says he was born 5 July 1873 in Cleveland. 1880- Gustave Prasse, age 52 is residing at 239 Birch with wife, Christina, 56; daughter, Augusta, 29; son, Charles 19; son, Manuel, 17; son Emile, 14 and grandson, Charles, 7. Gustave is working as a laborer; Charles, laboring; Manuel, shipping clerk and Emile, laboring. The grandson, Charles is most likely the son of Augusta Prasse and John Schweitzer even though he adopts the Zluhan surname after 1880. 1880 Fred Zluhan and Augusta Prasse are married by Rev. William Angelberger, pastor of the United German Evangelical Protestant Church. Angelberger was a successor to Stempel. The church book may contain her place of birth. Sent email on 3 April 2015 to Western Reserve Historical Society requesting copy of the marriage record. 1884- Fred Zluhan in Cleveland City Directory employed as locksmith at 151 Champlain and residing at 237 Birch next door to Gustave Prasse. 1900- Four of the nine children born to Christiana Prasse are still alive. The four would be Augusta, Charles, Frederick and Emil. 1912- Gustave Prasse died on July 22, 1912, in Cleveland, Cuyahoga County, Ohio, having lived a long life of 86 years, and was buried at Monroe Street Cemetery in Cleveland, Ohio. I have a sneaking suspicion that there is a Prasse descendant out there that has the information that I need tucked away in closet. If you can help me to locate Prasse descendants, please use the contact form in the right hand column.